U.S. President Donald Trump said Friday he has "no idea" about when Special Counsel Robert Mueller, who's leading the Russia probe, will turn in his report. 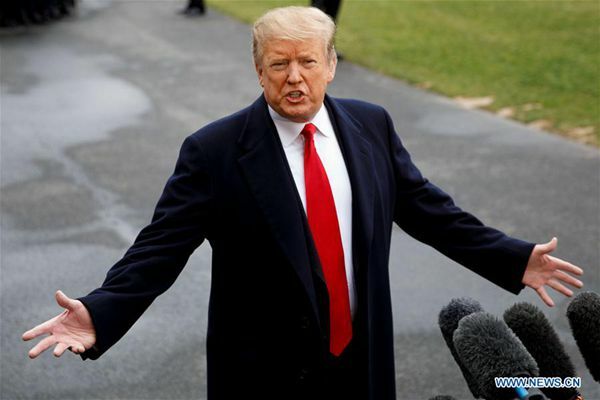 "I have no idea about the Mueller report," Trump responded on the White House lawn to the question from reporters if he expected the Mueller report to be submitted on Friday, before he left for meetings at his Florida estate. "We're going to see what happens." Those remarks were made as Washington braces for the highly-anticipated report by Mueller, whose nearly two-year investigation has focused on possible collusion between the Trump campaign and Moscow during the 2016 presidential elections and whether the president obstructed justice. Trump on Friday continued to claim that there was neither collusion nor obstruction, calling the wide-ranging inquiry a "big hoax" and "witch hunt." The president added that Attorney General William Barr, whom he nominated late last year to replace Jeff Sessions, "ultimately will make a decision" about the report's release. The public has been speculating that the Russia probe is coming to an end after several high-profile departures from Mueller's office recently. Mueller, who was appointed by Deputy Attorney General Rod Rosenstein in May, 2017, is required to submit a report to Barr at the conclusion of his investigation. Barr, in turn, is required to notify Congress about Mueller's findings. According to the Department of Justice's special counsel regulations, the report must explain Mueller's "prosecution or declination decisions" but may not be comprehensive to lawmakers. "I have a deputy, appoints a man to write a report on me, to make a determination on my presidency," Trump said in an interview with Fox Business Network aired Friday morning. "People will not stand for it." Earlier this week, Trump told reporters he didn't understand why Mueller was writing a report, but that he wanted the general public to see it anyway. Mueller's team has brought charges against 34 people, including six Trump associates, and three companies. The special counsel hasn't made a direct allegation of collusion. Russia has denied any meddling in the U.S. 2016 presidential election. Trump said Friday he has "no idea" about when Special Counsel Robert Mueller, who's leading the Russia probe, will turn in his report.